Last week started with enormous excitement. I took the children to the Christmas fair at school, and then my husband and I went away for an entire night – get this – without them! We were invited over to Cambridge for a meal last Friday, and the grandparents very kindly had the children over to stay. Think it might be the first time our son has ever spent a night away from both us. Given he’s just celebrated his seventh birthday, it’s been a while. Fabulous food, rather too much wine and I even had to wear a dress, so my long black swishy number got a rare outing. 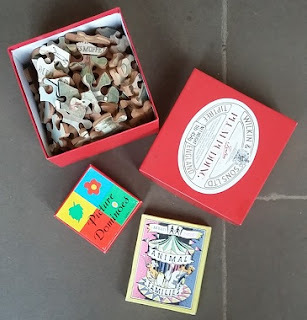 Chunky jigsaws, retro packaging and loads of Lego. What’s not to love? We made it back to collect the children in time for lunch on Saturday, and then spent part of the afternoon playing games. The grandparents have a great collection of retro toys and games which the children love getting out. We all played snakes and ladders, and I also ended up racking my brains trying to remember the rules of draughts. It made me remember that we have such a great time for free whenever I drag out games like Othello, Junior Monopoly or cards. We should do it more often. Always good to buy our food for 8% less. Regular readers may remember me banging on about Zeek in the past. It’s a website where you can sell unwanted gift vouchers and buy them at a discount. Last week Zeek emailed an offer code for an extra £3 off on top of the normal discounts. This meant I could buy £50 of Morrisons vouchers for just £46, knowing we will definitely use the money for our food shopping. It was the first time I’d bought paper vouchers from Zeek, rather than an eGift card to use online, and they arrived after only a couple of days. I also bought one on my husband’s account (sneaky eh), and spent £10.30 to get £15 Pizza Express vouchers. We don’t eat out very often, but we do occasionally go to Pizza Express as a family treat. The children like the piccolo menu, and if I use the gift voucher with an offer from the website or topped up with Nectar points, it will keep the costs in check. 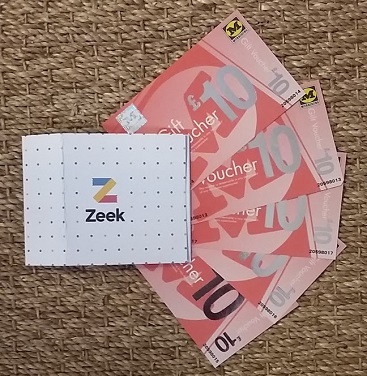 I genuinely think you can save money if you use Zeek to get cut-price gift vouchers for stuff you’d buy anyway. They’ve even got a sale on at the moment. If you’d like to give Zeek a whirl, you can get a free fiver (and I’ll get one too) by bunging in the promo code 2CJTLAUC. Worth a thought, to help towards the cost of Christmas! Half price, no delivery charge and all on points. Bargain. I don’t buy much from Boots, because I reckon many of the products can be found cheaper elsewhere. However, if I do shop at Boots, I always use my Boots Advantage card, as it’s a pretty generous loyalty scheme. I won’t buy stuff there just for the points, but it’s often a good bet for my contact lens fluid, and we rely on the very helpful pharmacist and his team here in Hadleigh. Anyway, I hoard Advantage Points during the year, and then spend them on Christmas presents. Currently, Boots are selling photo frames for half price, so I nabbed a couple on points, and avoided delivery charges by requesting Click and Collect to our nearest branch. Normally, the frames I chose would cost £24 but I got them entirely free. I’ll use them to frame prints of the glossy family photo that ran with my Sunday Times article on heating oil. It’s so rare to have any photos of all four of us together, let alone one where we’re all looking at the camera at the same time! 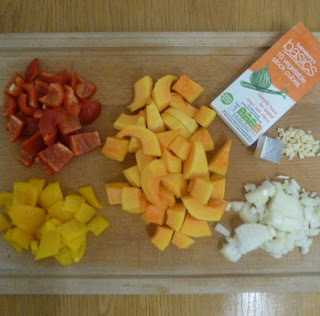 Ingredients for squash and pepper soup. We had a pretty good week for managing to use up leftovers. I made chicken stew last Sunday with mounds of mashed potato, so my husband could take in an extra portion for a packed lunch the next day. We also finished off some leftover rice with a stir fry another night. So long as you get the rice into the fridge quickly, and make sure it’s piping hot when you reheat it, it should be absolutely fine. Now the weather is turning colder, I used a couple of cut-price yellow-stickered peppers to make butternut squash and pepper soup, which is one of my favourites. I wrote up the recipe for an article in the Mirror last year, if you’d ever like to try it. Chocs and drinking choc for £1.95? Don’t mind if I do. Believe it or not, I don’t think being frugal is all about deprivation. As you can tell from the blog title, I’m all about making much more from less. I do believe that the most important things in life aren’t things at all, and try not to define myself in terms of money and possessions. However, if I’m going to spend money, I like to make the most of it. Which brings me to chocolate. Sure, I use value range chocolate for cooking. 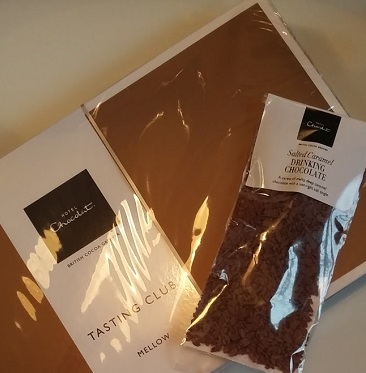 But as a Christmas treat, I’m rather partial to a box of Hotel Chocolat chocs. In particular, I like to get a £22.95 box when it’s £6.95 as an introductory offer to the tasting club. I signed up by clicking through TopCashback, the cashback website*, so fingers crossed I might yet get £5 cashback too. (Post explaining cashback websites here). If so, that box of chocolates and the free sample of salted caramel drinking chocolate will end up costing £1.95. Just make sure to cancel the membership before getting sent extra boxes, if you want to avoid any extra expense. Anyone else have any frugal triumphs to celebrate in the run up to Christmas? Any little luxuries you like getting for less? You have certainly had a good week! That is sweet that your son hasn't been away from both of you for that long, but it would probably have driven me insane 🙂 I love it when my mother in law offers to have my daughter, it's a win-win for all of us! 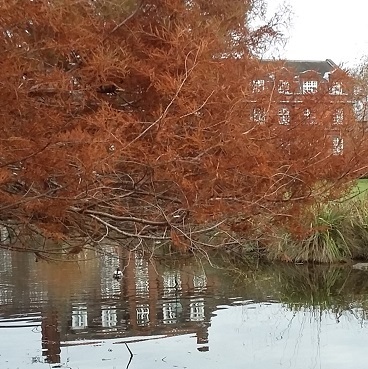 what a fabulous week. Hmm. I am going to have to start following some of your tips, in particular the chocolate one! Thanks Sadie! Reckon the chocolate tip is a particularly good one to start with. I do look forward to my Hotel Chocolat chocs, come Christmas Day.